When deciding to move abroad and become an expatriate, about 83% of the US Americans are generally satisfied with life elsewhere, according to a recent survey by InterNations. Among the US expat respondents, over two-fifths want to stay in their destination country forever. As more and more Americans tend to live around the world, we are going to discuss some tips and facts to help future and current long-staying US expatriates to better prepare for the steps into the unknown. One of the most important things that US expatriates should know about is US Expat Taxes. The US is few of the countries which require tax filing to its residents after they have moved abroad, even if you are paying tax in your destination country. To prevent penalties and earn a tax credit, American expatriates must file US tax obligation on time. Special regulations may apply when using foreign taxes paid as a credit against US tax obligations. It is essential for future and current US expats to understand US tax programs and talk to an expat tax professional. According to US International Social Security Agreements, The US has established many bilateral social security agreements that allow American expats to only pay social security taxes to one of the two governments. Eligible countries include Italy, Germany, Canada, United Kingdom, Spain, France, Chile, and Japan. This regulation can help eliminate dual social security taxation. However, the exact regulations may have specific exclusions and rules such as self-employment rules and territoriality rules. American expatriates should examine their destination country’s agreement descriptions to make sure that they are covered while living abroad. Again, talk to your tax and legal adviser. If you are thinking about driving in your destination country, please be aware that road conditions and driving regulations can be different from those in the United States. Insurance and a valid driver’s license are required in most countries. Many countries may not accept a US driver’s license, so you may want to apply for an International Driving Permit (IDP) or a local driver’s license. One of the most important considerations for American expats is obtaining global medical coverage, especially where local plans may be non-existent or adequate medical care may not be available. Your domestic health plan in the USA probably won’t cover you abroad, so you will need to search out an international plan assuming you will become a non-US resident. Therefore, it is critical for US expatriates to purchase an international health insurance plan. A good plan should provide a sizeable direct pay medical network, so you and your family won’t have to pay the out of pocket fee in multiple currencies. 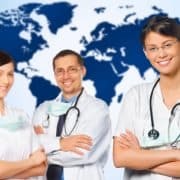 In addition, many international health insurance plans providers offer international medical networks with English speaking doctors and medical staff. If you are an American expatriate who is living abroad and often travels back to the United States, it is also important to get the American coverage option in your international health insurance plan. Most American expats residing abroad will seek out a global medical plan that includes the USA because if they suffer a serious medical illness or injury, the expat will most likely want to seek medical treatment back home in the USA. It is essential to cover your international health insurance needs with an expat insurance expert such as Expat Financial and weigh the costs and benefits of having an international health insurance plan that provides full coverage in the United States of America. Foreign Bank Account Report (FBAR) is a report of foreign bank accounts that based solely on your overseas account balances. This may be the case if you have a balance that exceeded $10,000 or more in your foreign bank accounts at any point during the year. Expat Financial offers independent advice, solutions and excellent service and support to clients around the world and we have extensive experience in sourcing medical cover for individual American expats and expat employers worldwide. We offer a variety of excellent global medical plans that can meet almost any need and budget. For more information and to review the plans that we offer, contact our office or visit our international health insurance page. If your organization has a group of two or more expatriate employees, our firm can source international group insurance plans. Note that the above tips are for informational purposes only as we are not tax advisors. We strongly recommend that you talk to a qualified tax accountant or lawyer to discuss your situation and requirements as these can differ from individual to individual. Sending employees abroad is a significant financial, moral and legal responsibility for expatriate employers. Many professionals are constantly talking about the importance of providing a “duty of care” for expat employees sent to work abroad and even when sending employees for long or short term assignments and meetings. A duty of care means that the global employer needs to take all steps required to safeguard and prepare for the safety, well being and health of their employees. It is the fiduciary responsibility that experienced global mobility managers realize is important regardless of the legal implications. It is a basic moral responsibility. This is especially true today in a world where conflict and terrorism can strike almost anywhere. It makes sense to plan for what your employees may face abroad. It is critical that expat employers meet the overseas obligations of their employees, whom can find themselves in new and sometimes hazardous regions and countries that they may not they may not be be adequately prepared for. It is vital that HR managers carefully read over employment contracts to make sure that the company is fulfilling its obligations to their employees. This means that employers should examine their employees needs and location to prepare for contingencies. Our firm has access to detailed country information packages that can provide global mobility managers with key insights for each destination, including security reports. When your HR department is sending employees overseas, it often makes sense to identify risk and to adopt preventive measures. You can’t account for all of the risks that your employees and their dependents may face while working or travelling abroad, but you can take steps now to plan and mitigate those risks. We recently had an employer who agreed to implement a comprehensive kidnap and ransom program with security evacuation, and in the first year of the policy it was used after a group of employees were kidnapped by bandits. Luckily, with the assistance of on-sight negotiators paid by the insurer, a ransom was negotiated, and the hostages were released unharmed. A recent report from Cigna mentioned that 50% of expatriate employees feel that their expat employers are not meeting their duty of care requirements for the global assignments that they are on. Furthermore, three quarters felt that they did not have sufficient funds to support their healthcare expenses. We often run into situations where new and even existing expat employers will send employees and their dependents on overseas assignments with inadequate planning and insurance coverage. With more and more companies and non-profit organizations sending employees for short or long term assignments to high risk countries such as Iraq & Afghanistan, the requirement to provide a secure and safe work location is vital. Our firm has extensive experience in working with employers operating in such areas where civil strife and conflict are commonplace. Business Travel Insurance for Short Term Assignments. It is critical that your global mobility department fully commit to the duty of care philosophy and provide global coverage for your employees that exceed what is required no matter where they are posted. Our firm can source plans for individuals and groups. For more information on the global benefit plans that we can offer your international workers, please contact us today. https://expatfinancial.com/wp-content/uploads/2017/06/iStock_11348678_SMALL.jpg 565 848 David Tompkins https://expatfinancial.com/wp-content/uploads/2014/11/logo.png David Tompkins2017-06-15 14:29:222018-07-23 13:04:45Is your company meeting it's "Duty of Care" obligations to its expat employees?